An atheist group has filed a lawsuit seeking to prevent a cross made out of World Trade Center steel beams from going on display at the 9/11 Memorial Museum. American Atheists sued this week in state court arguing that the group opposes the placement of the cross in the museum because members believe it is the only religious article getting special accommodation there. 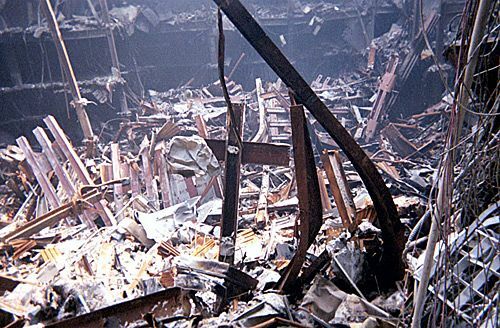 The cross, made of two intersecting steel beams, was found standing in the rubble of the World Trade Center following the Sept. 11, 2001 terrorist attacks. “This cross is now a part of the official WTC memorial. No other religions or philosophies will be honored. It will just be a Christian icon, in the middle of OUR memorial,” Dave Silverman, president of American Atheists, said in a release. “This country feels, in some way, God has forsaken them, and I don’t want that to be happening,” he said. Sorry, Frank, an atheist group doesn’t want to allow it, because it offends them. So, they’ll attempt to ruin it for everyone.